Removing the steering cable from a Johnson outboard takes just a wrench. 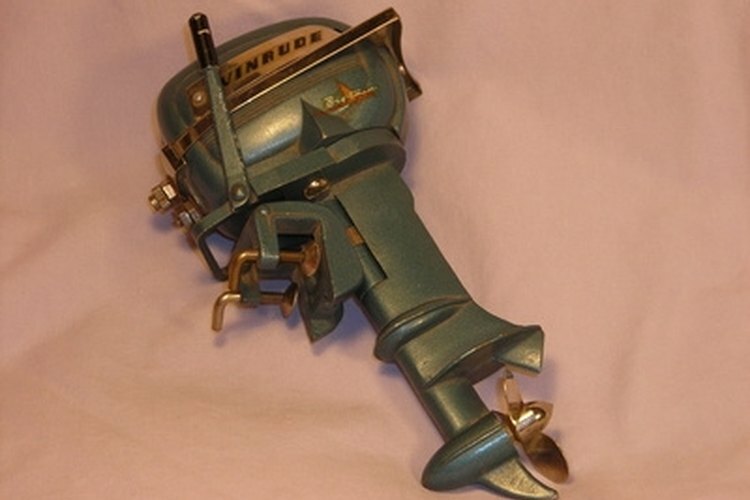 If you plan to remove the steering cable from your Johnson outboard, remember that the steering cable for an outboard that was built after 1980 is connected to the motor's tilt tube by a screw, regardless of the name on the motor. Whether you need to remove the cable as part of your winter storage or you want to remove the cable because you want to add a hydraulic system to your Johnson, the procedure is straightforward and consumer friendly. Use an adjustable wrench to loosen the washer-head bolt in the steering link rod fastener. The washer-head bolt is located on top of the steering link rod fastener at the end of the steering cable, attached to the engine's tilt tube. Remove the locknut--a self-locking nut with a nylon insert--from the end of the washer-head bolt. The locknut is nylon and located beneath the steering link rod fastener. One flat washer, between the nut and the steering link rod fastener, may come off with the nut. If it does not, slip it off the end of the washer-head bolt. Lift the washer-head bolt free from the steering link rod fastener and remove the flat washer from the bolt. Stash the washer-head bolt, the locknut and the washers in a pocket for later retrieval and storage. You may want to put a small tray under the steering link rod end as a catchment in case the flat washers drop away from the nut or washer-head bolt.